i.d. Mate Quest, Price: $1248 for 2 GB Storage, call Sendero to order. Shipping Notes: If items are in stock, they will normally be shipped from Sendero within 2 days. Contact us or call to check the product status before placing your order. By default, products are shipped from Sendero in California via UPS Ground, 5 to 7 days IN TRANSIT to the East Coast after the order is ready to ship. Choose the Rush shipping option for an additional $20 if you wish to reduce the shipping time to 3 days. i.d. mate Questis a portable "all-in-one" talking bar code scanner that aids visually or print impaired individuals with the identification of items via the product's bar code or UPC. Using text-to-speech and digital voice recording technologies, it allows users to access an on-board database of product descriptions, along with a tailored set of recorded voice messages. With i.d. mate Quest, the user can quickly add additional voice recorded information to existing products or to items not found in the database. Additional bar code labels are available to label any product or item that does not already have a bar code. Adhesive, tag, and clothing labels can be placed on nearly anything. Simply scan the bar code and add a voice recording. And with i.d. mate Quest, you now have additional modes of identification and information access with wireless internet connectivity and an on-board camera. This provides for multiple features such as an extended database, pricing, currency identification, Skype video conferencing, and object recognition. Text-to-speech and digital voice recording technologies allow the blind or print-impaired user to access items in their environment with a simple scan of a bar code. This talking bar code scanner provides instant identification of products, access to information, and affords a more independent life. Programmable bar code labels are provided to label any item that does not already have a bar code. Built-in database items include grocery, health & beauty, pets, cleaning, vending, and CDs & DVDs. Extended information such as instructions, ingredients, and warnings are included for many items. This multi-million item database is just the beginning; it can be tailored to personal needs by adding items. Country-specific databases are available. Wi-Fi and Bluetooth connectivity make the database truly infinite. With direct access to numerous Internet resources, the user can update the database, look up unidentified items, and online pricing via Google. An on-board camera provides access for currency identification and other features such as Skype internet phone (beta). Use the integrated camera to get help reading documents, locating items, or for staying connected with family and friends. MP3 capabilities allow the user to store and access music and audio files. The i.d. mate Quest package includes the following: i.d. 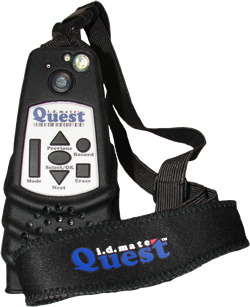 mate Quest digital voice recorder; hand-held omni-directional Bar Code Scanner; Carrying Case with shoulder and waist straps; Li-Poly batteries; power adapter; 100 Pre-printed Bar Code Labels (used for items that don't have an existing barcode); first database update free; and 2 GB Card.